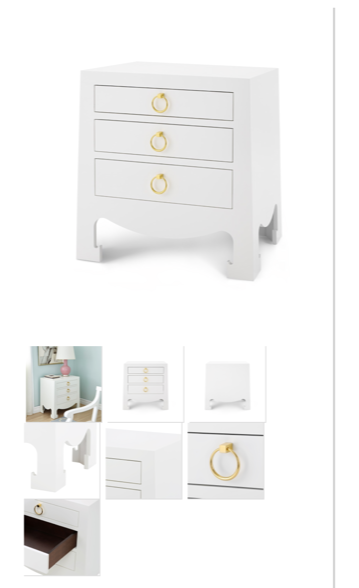 As you guys know, I'm really into Bungalow 5's Jacqui nightstand at the moment. It's clean lines and gorgeous turned legs - a great example of traditional design that feels fresh and current. But they're priiiiiicey people! and would definitely bust our budget. So I decided to look for something with a similar style and feel, and that would look good in our bedroom. ... I stumbled upon this FANTASTIC pair of ming nightstands right here at a local antique shop! Clean lines, a beautiful carved base & in great shape. And they were a pair (rarer than you'd imagine!). Sometimes you walk into a place and come upon a real treasure & you just gotta go for it! But me being me, I still gave it a day's worth of thought & whipped 'em up the next day. I considered having them professionally rejuvenated / refinished, but honestly they were in very good condition so I decided to give 'em a go! They needed some love to smooth out the surface and fill in a spot or two, which I felt I'd be able to manage. 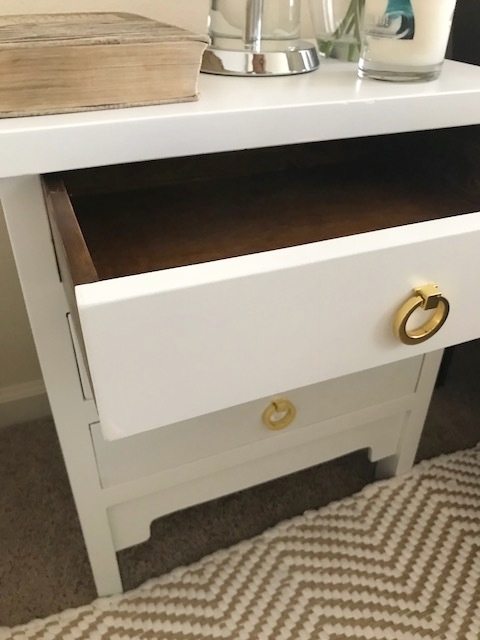 The following weekend I bought white spray paint and ordered 6 polished brass ring pulls. Sanding, priming and a few coats of spray paint later....ta-da! I left the insides of the drawers a rich stained oak that they already were. It makes for a nice contrast and gives the stands a little edge. I'm THRILLED with how they've turned out you guys! They look great in our bedroom and lend it such a charm. I used Rust-oleum's white primer and gloss white spray print, and Minwax's semi-gloss polycrylic to seal it off. All great choices & I'd definitely recommend them for any spray paint job you have coming up. I prefer semi-gloss for an understated look (especially with polished hardware). High-gloss if you're going glam or ultra-modern.